Investors seeking lower volatility securities may be interested in learning about the PowerShares S&P 500 Low Volatility Portfolio (SPLV). If you read and watch market news as much as I do, you have heard prognosticators warn about slowing economic growth and high market volatility. With many observers speculating that we are heading into another global recession in the next couple of years, equities have not performed well lately. 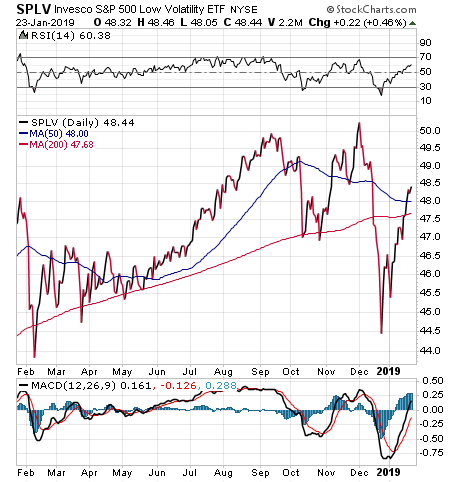 But SPLV offers a possible defensive purchase for wary investors who like the exchange-traded fund’s (ETF) focus on replicating the performance of the 100 lowest volatility stocks in the S&P 500 Index, before expenses and fees. So, while large swings in the market can cause a lot of anxiety, the positions in the SPLV tend to move less than the overall market. The fund’s holdings are typically blue-chip companies that are much less volatile than other stocks in the S&P 500 Index. The highest-weighted stocks in SPLV are those that have the lowest volatility. For example, the utilities and consumer staple sectors make up the majority of the SPLV, 32.80% and 22.94%, respectively. These sectors tend to outperform more volatile sectors such as technology or energy amid heightened uncertainty. However, these securities aren’t likely to grow very much, since they’re already pretty large. They do, thankfully, usually pay out a solid dividend. The fund’s 10 top holdings feature Coca-Cola Co., 1.30%; Duke Energy Corp., 1.22%; Exelon Corp., 1.20%; Republic Services Inc., 1.19%; WEC Energy Group Inc., 1.19%; CMS Energy Corp., 1.18%; Dominion Energy Inc., 1.18%; NextEra Energy Inc., 1.17%; American Electric Power Co. Inc., 1.16%; and Consolidated Edison Inc., 1.16%. These stocks tend to outperform in bear markets and underperform in bull markets. They are companies in industries such as utilities and consumer staples that offer defensive places to invest your funds. Even when consumers spend cautiously, they still prioritize keeping their lights on, bathing and eating. SPLV is an ETF that could have performed well during the most recent recession in 2007 had it been in existence then, but it launched in May 2011. It also could be a good addition to your portfolio now, if you believe that the defensive stocks held in SPLV are poised to outperform the market in the months and years ahead. Investment expert Jim Woods urges his readers to be more kind towards other human beings.